LG's 2018 TVs will support Google Assistant | What Hi-Fi? Google Assistant will be available to customers in certain countries, alongside LG's own virtual assistant that will control its ThinQ-branded products. We may have a few days until CES 2018 officially kicks off, but LG is getting its news out early by announcing that its new line-up of 2018 televisions will have Google Assistant built in. LG's 2018 OLED TVs will also be powered by a new processor dubbed Alpha 9, while its new Nano Cell Super UHD LCD TVs will feature Full-Array Local Dimming (FALD) backlighting. The Alpha 9 processor will power artificial intelligence and language processing, which will be accessed using a microphone in the TV's remote control. LG has confirmed the inclusion of Google Assistant alongside its webOS operating system, but this will only be available to "customers in certain countries" - and the company is yet to say which. 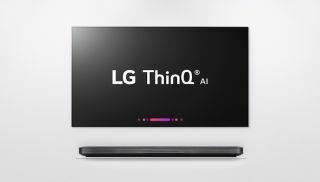 With LG announcing its ThinQ brand of artificial intelligence before the Christmas holidays, and similar features coming to its ThinQ-branded smart speakers, it looks like the company is positioning its televisions as smart-home hubs. LG suggests that users will be able to give vague commands such as “search for the soundtrack of this movie” or “turn off the TV when this programme is over”, without actually mentioning the name of the programme or entering a specific time. On the visual side, the company claims that its new Alpha 9 image processor can provide extra realism through advanced noise reduction and colour correction, even at 120 frames per second. LG claims the Full-Array Local Dimming tech which will feature on its 2018 Nano Cell 4K TVs, can provide deeper blacks and enhanced colours, through "independent control of LED light zones". We'll be bringing you all the latest news on LG's 2018 TVs on Monday 8th January, so be sure to head back to whathifi.com for the complete lowdown.